Former WNBA play­er and Olympic gold medalist Chami­que Holdsclaw is being indicted in a November 2012 shooting in Atlanta, prosecutors said Wednesday. A six-count indictment charges Holds­claw, 35, with aggravated assault, criminal damage and possession of a firearm during the commission of a felony, Fulton Coun­ty District Attorney’s spokeswoman Yvette Jones said Wednesday. Holdsclaw was arrested after an argument with Tulsa Shock player Jennifer Lacy, 29, who told police she was Holdsclaw’s ex-girlfriend. The two were also Atlanta Dream teammates in 2009. Holdsclaw broke the windows to Lacy’s car and shot at it Nov. 13, 2012, police said. No one was injured. After a late-Nov­em­ber court appear­ance, one of Holds­claw’s attorneys said he talked with Lacy and they were trying to resolve the case. He acknowledged that Holdsclaw caused damage to Lacy’s car, but said his client never intended to hurt her. “Sometimes charges get made that exceed the scope of the actual events,” Garland said, adding that he and his client plan to resolve the case without it going to trial. Holdsclaw is out on $100,000 bond and a court date has not been scheduled. Holdsclaw led the University of Tennessee to three consecutive national championships from 1996-98 before beginning a pro career that included six WNBA All-Star selections. 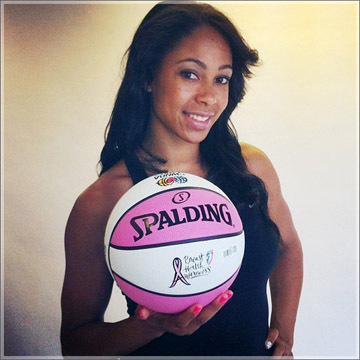 She also played on the U.S. Olym­pic team that won the gold medal in the 2000 Games. She had 3,025 career points at Tennessee and remains the Southeastern Conference’s career scoring leader.